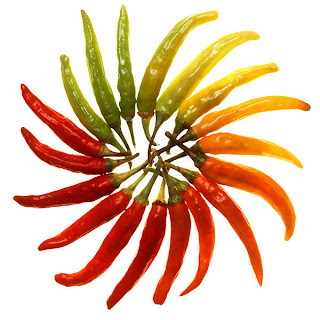 The Fresh Hot Sauce Blog: A Brief History of Hot Pepper & Sauce with Observations! A Brief History of Hot Pepper & Sauce with Observations! You know Hot Sauce didn't just suddenly appear in the foods and diets of all of us, or of those of us of Old World Stock. In fact before Columbus discovered wild Hot Peppers growing on the Caribbean Islands he first visited, no one from Europe, Africa, China, or South East Asia ever had anything hotter in their diets than various types of black pepper and, I suppose Sichuan pepper. In fact (again), Columbus even named hot peppers, peppers, because they had a hot kick like, well, black pepper, and he thought they were somehow related. They aren't. Imagine that, no hot Thai curries, no African Piri-Piri, no hot Chinese dishes, no Italian dishes Fra Diavolo, or Arrabiata ... well, NO food anywhere outside of the Western Hemisphere with Hot Peppers. There are a number of histories of Hot Sauce on the 'net, and I thought it would be fun to talk about one. The history on the ChilliWorld Site which is a UK seller of Hot Sauce offers an interesting and brief rundown, starting with the advent of Hot Peppers (up to modern Hot Sauce from Tabasco to Insanity and Death) as we know them around 100,000 years ago in the Amazon jungle of Brazil and spreading naturally or through cultivation by native peoples into what is now Mexico and the Caribbean perhaps around 6000 years ago. The Aztecs are said to have liked Real Hot Chocolate, a double New World Whammy, since both Chocolate and Hot Peppers are New World foods, like tomatoes and potatoes. Yeah, those, too. What was Italian food like before tomatoes, before red pepper? Geez. For that matter, imagine the first human, perhaps 20,000 or more years ago, whose ancestors had crossed the land bridge from Siberia to Alaska, and whose subsequent generations had moved south into Central and South America, first trying a Pepper Fruit -- it is a fruit, you know -- hope it wasn't a Habanero! -- and thinking -- What??? Holy Cow!!! Well, they say hunger is the best condiment. And clearly, even if the first guy didn't like them, somebody eventually did like Hot Peppers, and enough to grow them in large scale throughout Cental and southern North America and the Caribbean. Interestingly, only mammals taste the Heat of the Hot Pepper, and of all of the mammals who can taste that Heat, only Man Likes It! Or some of us, anyway. It is theorized that it's the Hot Pepper's and Nature's way of discouraging mammals with grinding molars that destroy the Pepper Seeds, but not birds and other animals who swallow the seeds whole and pass them through and distribute them. But Evolution hasn't caught up with Chile Heads, at least not yet, and having seen some Chile Heads, I have to say, Evolution didn't have much to do with them in the first place! For those of you interested in a brief history of the plants themselves, check out the Wikipedia article. Anyway, there is a big grey area as to what happened between Columbus bringing Hot Peppers back to Spain, and how they got distributed throughout the rest of the Old World, along with Peppers brought back on subsequent trips. Now of course, we'll never lose the history of Hot Sauce from Tabasco on, 'cause it's DIGITAL!